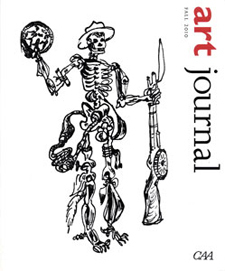 The Fall 2010 Art Journal, CAA’s quarterly of cutting-edge art and ideas, has just been published. The issue explores the broad theme of “war and other disasters” in six essays, three artists’ projects, and an interview. Katy Siegel, Art Journal’s editor-in-chief, observes that the contributors “point to ways in which we are still living in a postwar world, working through the rubble of the atomic bomb and under the shadow of its future use.” David McCarthy writes on David Smith’s Spectres sculptures from the mid-1940s, and a pen-and-ink sketch by Smith graces the issue’s cover. Cécile Whiting’s essay explores early-1960s works by Californian artists who were intrigued by World War II, and Jung-Ah Woo frames On Kawara’s Date Paintings as manifestations of tragedy, violence, and death. Through the lenses of politics, reenactment, and memory, Claire Gilman looks at drawings by Andrea Bowers, Sam Durant, and other contemporary artists. In the Reviews section, Margaret Iversen assesses Douglas Eklund’s catalogue for his exhibition The Pictures Generation, 1974–1984, and William McManus examines three recent books on the dancer, choreographer, and filmmaker Yvonne Rainer. A benefit of CAA membership, Art Journal is mailed to those individual members who elect to receive it and to all institutional members.